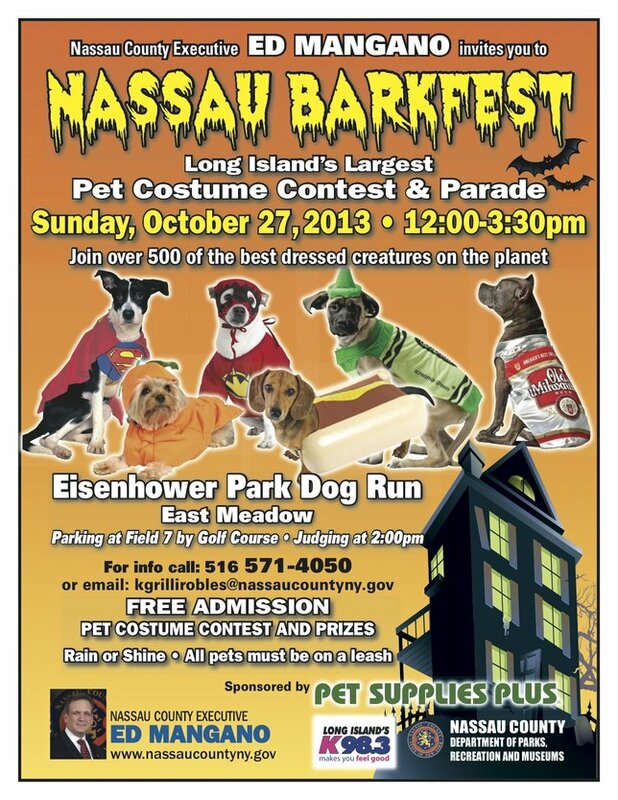 Join Nassau County for their 3rd Annual Barkfest event on Saturday, October 27th! East Meadow, NY - October 15th, 2013 - Nassau County Executive Edward Mangano, Pet Supplies Plus LI, and Long Island’s K98.3 bring the third annual Nassau Barkfest, Long Island’s largest pet costume contest and parade, on Sunday, October 27th from 12:00pm to 3:30pm at the Eisenhower Dog Run in East Meadow, rain or shine. For this Halloween-spirited celebration, guests are to bring their dogs and other pets dressed in costumes for a chance to win prizes. Costume judging and awarding of prizes will begin at 2:00pm. The event will be open to the public with free admission. Pet owners will enjoy music by K98.3 while they browse pet-related exhibitors and animal rescue organizations. All pets must be on leashes or in carriers, and current with vaccinations. Parking for the event will be in Eisenhower Park Field 7 near the golf course. Costume Judging & Prizes at 2:00p.m. Subject: LongIsland.com - Your Name sent you Article details of "Long Island Pet Owners Celebrate Halloween With Nassau County's Third Annual Barkfest"